EDIT: In Part 1 we will talk about the pawn structure followed by a game played by Botvinnik playing the Stonewall structure on the black side. In Part 2, we will look at examples played on the white side. Then on Part 3 we can put it all together, talking more about playing the Stonewall from the black side. Wouldn’t it be cool to build a massive shield that you can hide behind while you fire shots at your enemy, while not getting hit at all? In fact, in a lot of games (and different sports) played by strong players, they would also apply the same technique. Throwing jabs and punches out there at your opponent while you’re in a safe position from having the same being done to you. The squares on e4 and c4 (particularly the e4 square) are considered weak in this structure, black may use the square on e4 as an outpost and the square on c4. In the endgame, white may also find it difficult to deal with incoming pieces placed on squares like h4 and a4, especially with knights. Of course, these squares are normally not accessible in the opening to middlegame phase. the squares on d5 and f5 are usually occupied with either pawns or pieces. 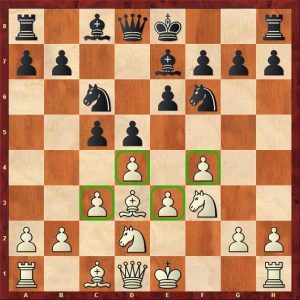 If black has not commited d7-d5, he may choose to go for a central pawn break with d6 and e5 against white’s centre. This is an important idea to be aware of. 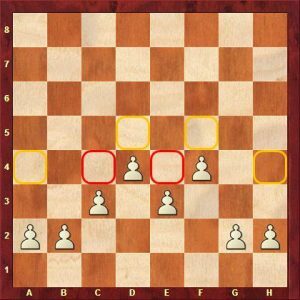 Now that we have these things in mind, we realise that white actually gets weaker in the endgame, given that enemy knights are still on the board and that the weaker central light squares may become occupied by enemy pieces. Let’s move on to the games. 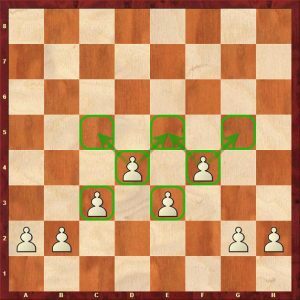 The first game we will look at, comes from Botvinnik, playing the Stonewall formation on the black side. That was a quick one. See you guys in Part 2, where we will talk about the different move orders and formations when playing the Stonewall on the white side and the different ways black can meet the Stonewall. In Part 3 we will talk more about playing the Stonewall on the black side again. ❤ from the ilovechess.net team.